Yousafzai (center in red) with Babu and Mammadova to her left and right, respectively. Photo by Luz Mary Mateus Gonzalez. When Naila Mammadova heard she was selected to attend a private event with Nobel Laureate Malala Yousafzai, she couldn’t believe it. Normally, she’s not so lucky. Mammadova—a graduate student from Azerbaijan in the School of Communication—was chosen randomly along with 19 other international students to see Yousafzai speak at the Newseum. It was an opportunity the Fulbright scholar won’t soon forget. Coming to AU, she knew she’d be seeing politicians and thought leaders both on campus and across the city. In fact, that access drew her to study in D.C. Participating in this experience on the heels of President Obama’s visit to the School of International Service, however, Mammadova was more than impressed. At the private event of around 100 people, students enjoyed traditional Pashto music and poetry before the 18-year-old Yousafzai spoke and engaged in a brief Q&A on educational access for girls around the world. 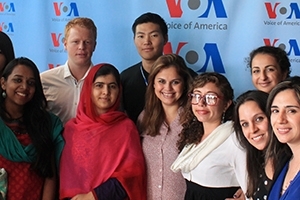 The Pakistani-born Yousafzai was honored with the 2014 Nobel Peace Prize for her advocacy, after becoming known for her blog on the importance of girls’ education that made her a target of Taliban gunmen in 2012.
International Student & Scholar Services associate director Kristina Thompson helped organize the outing after an invitation from the Voice of America, who hosted the event. She sees the occasion as one of many chances to be involved in global and intercultural conversations that students will have while at AU. For grad student Asvatha Babu, meeting the group from AU that attended the event provided great excitement in itself. In just her first week at AU, Babu found herself meeting students from as far away as Burma and Namibia—something rare back in her home of South India. Babu will have a number of chances to learn from others’ life experiences, as AU features a vibrant population of some 1,700 international students and scholars representing 140 countries. For Thompson, this set of high-achieving students from across the world is a valuable asset to all students—just as valuable as AU’s proximity to such events and opportunities. Whether educationally, professionally, personally, or all of the above, international students are finding huge benefits at AU. Thompson promises good things are to come for these students, but she can’t guarantee another Nobel Laureate. Are you an international student or a student interested in all things global? Then don’t miss ISSS’s Global Café. For the first four Fridays of the semester, come to Butler 4th floor 4-5 p.m. to meet students from across the world and enjoy delicious snacks. Would you rather engage in the Language Exchange Program or intercultural TALK dialogue group? Go for it!